Our revolutionary Extreme Fat Burner formula is specially designed to assist in weight loss. Phaselous extract may help stop carbohydrates being broken down as well as sugar and starches being converted to fat. Chitosan works like a sponge as it absorbes fats and sugars from food prior to passing through the digestive system. Other potent ingredients have been added to help stimulate metabolism, improve digestion, increase energy levels and preserve lean muscles. Safe, natural and has no side effects! 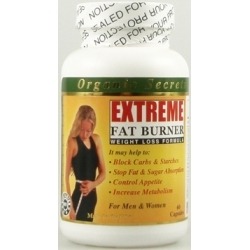 Extreme Fat Burner. Weight loss formula. It may help to: block carbs and starches, stop fat and sugar absorption, control appetite, increase metabolism. Ideal for Men and Women. Dietary Supplement contains: Northern White kidney Bean, Chitosan, Siberian Ginseng root, Korean ginseng root, bromelain, papain.